Nikon D3400 DSLR Camera â A sleek and better built Nikon D3400 produces better image quality than your smartphone which can now be connected to one for easy sharing. Utilizing a DX-format 24.2MP CMOS sensor and EXPEED 4 image processor, this camera provides a native sensitivity range from ISO 100-25600 to suit working in a variety of lighting conditions, and the sensor and processor combination also provides a 5 fps continuous shooting rate as well as Full HD 1080p video recording at 60 fps. AF-P DX 18-55mm f/3.5-5.6G VR Lens from Nikon provides a suitable companion to D3400. It offers a 27-82.5mm equivalent focal length range as well as a compact form factor. Many shooters will find this to be a versatile and lightweight option for their bag. It uses a variable f/3.5-5.6 aperture to keep size down and incorporates two aspherical elements to limit distortion and combat aberrations. Also, the Super Integrated Coating will combat flare and ghosting. This bundle comes with a soft padded water resistant camera case which is suitable for carrying your Nikon D3400 freely and with ease anywhere you go. Donât miss on the action with this sleek camera bag. 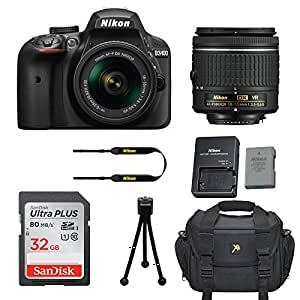 Additionally the bundle also includes EN-EL14A Rechargeable Li-Ion Battery for Select Nikon Cameras, MH-24 Quick Charger, SanDisk 32GB Ultra Class 10 SDHC UHS-I Memory (High speed card for quick data transfers) and a tripod.